If you are at all familiar with Turkmenistan’s recent history, then you have likely been acquainted with its grandiose (and often golden) monuments. Their origin can be traced back to the late Saparmurat Atayevich Niyazov—or Turkmenbashi—President of Turkmenistan between 1985 and 2006, when he passed away. Gargantuan in size, these monuments served to reinforce Niyazov’s infamous cult of personality. Sculptures of him dominate the nation’s landscape to this day. “The First Monument to Turkmenistan’s Second President.” Chronicles of Turkmenistan, July 30, 2014. Accessed September 15, 2015. http://www.chrono-tm.org/en/2014/07/the-first-monument-to-turkmenistans-second-president/. Qishloq Ovozi. “Here We Go Again: Turkmen Statue Proposal Suggests History May Be Repeating Itself.” Radio Free Europe, July 28, 2014. 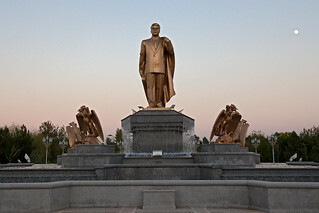 Accesses August 21, 2014. http://www.rferl.org/content/turkmenistan-statue-berdymukhammedov/25473028.html. Ella Morton. “Golden Statue and Mother Bread: The Bizarre Legacy of Turkmenistan’s Former Dictator.” Atlas Obscura, February 6, 2014. Accessed February 20, 2014. http://www.slate.com/blogs/atlas_obscura/2014/02/06/saparmurat_niyazov_former_president_of_turkmenistan_has_left_quite_the_legacy.html. For videos and photos, please see original article here. To watch Turkmen state television is to know no citizens love their president and enjoy regaling him with spectacles more than those of Turkmenistan. Every month, thousands of people assemble at stadiums or parade grounds to participate in carefully choreographed festivals that celebrate their country and its leader, Gurbanguly Berdymukhammedov. The official calendar lists 24 national celebrations, ranging from the "Day of Turkmen Workers of Culture and Art" to "Turkmen Melon Day." But there are scores of other mandatory events, such as the "Day Of Neighborliness," which also must be observed in every town and village. In some months, state newspapers have announced as many as 64 occasions to be celebrated during a four-week period. Government employees and students -- the two most frequently drafted groups for the celebrations -- are left with little free time of their own. "For the past seven to eight years, because of the mass events and festivals, people who work for the government have forgotten what having time of your own on weekends and holidays is like," says one Turkmen, who identifies himself only as Arslan. "For example, every weekend there is an event, from national bike-riding day to a visit by the president. On such days people wake up at six in the morning [and participate] until around 11 in the evening, when the president leaves again. Everyone has to be on his feet outside, no matter whether it is hot or cold. There is no way for people to keep busy with things they like, such as reading books or relaxing." Once a person is selected to participate by an office or school committee, the only way to escape a celebration is through a medical exemption. Otherwise, one goes straight into days or weeks of rehearsals in which thousands of people are drilled simultaneously to perform synchronized steps. The steps may range from dance moves to holding up colored cards simultaneously with thousands of other people. During the rehearsals -- and the performance itself -- the rules are strict. No water bottles. No food. No talking to those around you. One student, who only gives her first name, Humay, is a veteran of such rituals. "I have participated in many of these events," she says. "Generally speaking, they are all unnecessary and no one wants to take part. For example, when there was an independence day celebration [on October 27], it usually was organized in the evening, so we were taken every evening for rehearsals, several days in advance, and had to spend all day out in the cold, just sitting there hungry and thirsty." The ban on drinking can have dire consequences, especially for children. One student, who gives her name only as Bahar, remembers contracting dysentery after she and her schoolmates quenched their thirst from a public fountain in Ashgabat. "It used to be extremely difficult in summer times, because we were not given drinking water," she says. "I remember a situation when I was in the fourth grade and we were standing for so many hours without water that when it was over we ran to the nearest public fountain and drank the [unclean] water directly from the pool." Often participants have to wear clothes that are inappropriate for the weather as they take part in pageants wearing national costumes. Women may stand in colorful summer dresses in the middle of Turkmenistan's harsh winter and afterward fall seriously ill. Men may wear rustic winter coats and sheepskin hats in the heat of summer and sometimes collapse from dehydration. They must constantly smile at the cameras and an audience of citizens who, themselves, are required to attend. Such mass celebrations are not new to Turkmenistan. They were fostered by authoritarian President Saparmurat Niyazov -- Berdymukhammedov's predecessor -- who continued the tradition of Soviet state spectacles after the country's independence from Moscow in 1991. Niyazov used the celebrations to help create a personality cult that also included mandatory school study of "Rukhnama," his book of personal musings. But correspondents in Turkmenistan say Berdymukhammedov, who came to power upon Niyazov's death in 2006, favors still more frequent and elaborate public celebrations than his predecessor. State-run media declared in 2012 that Turkmenistan had entered a new "era of supreme happiness" in the wake of Berdymukhammedov's landslide reelection -- and public celebrations are key to supporting that message. "There has to be this constant show of success, of prosperity, and of enjoyment of being the nation that you are," says John MacCloud, an expert on Central Asia at the London-based Institute for War and Peace Reporting. "You need intense political pressure to maintain that kind of narrative of a state that is not only wonderful but getting better. We saw it under Stalin in the 1930s, where oppression was matched with these joyous stories and mass ecstasy, and we see the same attempt in North Korea, and we saw it to an extent in [Nicolae] Ceausescu's Romania." But if the mass celebrations serve the Turkmen government's purpose, they place a heavy burden on the population. Not only do Turkmen citizens lose their private time to the events, they also must pay out of their own pockets for the costumes many of the celebrations require. Teachers order students to bring money from home for clothes and accoutrements, then turn the money over to state ministries responsible for supplying the goods. At times, the expenses go far beyond a new three-piece suit for boys or a new national dress for girls -- purchases already burdensome for poorer families. They can also include buying a tree sapling or a new bicycle -- the choice essentially depends on whether the parade one is drafted for is to celebrate National Tree Day or National Bicycling Day. Turkmenistan’s president has unveiled a five-metre-high bust of his father, a retired interior ministry official who is still alive, state television reported Tuesday. President Gurbanguly Berdymukhamedov, a dentist by profession, took over power after the death of eccentric dictator Saparmurat Niyazov, who renamed the month of April after his mother as part of a bizarre personality cult. The Turkmen president was shown bowing respectfully to the bronze bust on a five-meter-high granite pedestal depicting his father Myalikuguly Berdymukhamedov, 81, a retired interior ministry lieutenant colonel. State television praised the president's father as an "example of conscientious, selfless service to his people and his beloved Fatherland". The bust is in a camp for interior ministry troops on the edge of Ashgabat, which is also named after the president's father, who appeared in public in February voting in presidential polls. The complex already includes a museum devoted to the president's father, who retired in 1982. Among the exhibits are his uniform, telephone and typewriter as well as a carpet embroidered with a line from a poem he wrote: "Let's plant more grain." Berdymukhamedov has embarked on tentative reforms even if his critics say the stabs at change have been little more than window dressing and he has done little to truly dismantle Niyazov's legacy.